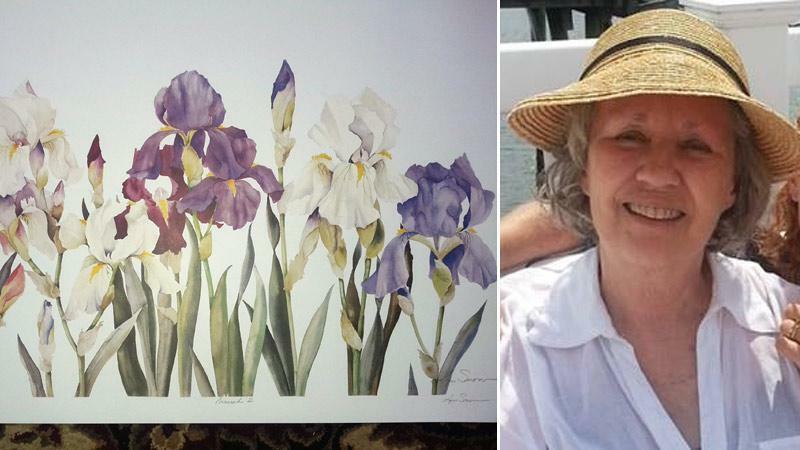 Lyn Snow (right), 72, was well known for her lyrical watercolor paintings of flowers. As disease trackers investigate, and Snow’s family prepares her funeral on Saturday, they are hoping her life and her death will inspire others to vigilantly check themselves for ticks after spending time outdoors — even in December, when hardy deer ticks are known to endure. Two cases of a rare and severe tick-borne illness have prompted warnings that the threat from ticks can persist into December. Lyme disease, transmitted by deer ticks, had already inflicted plenty of misery in the Snow family in recent years, with Snow diagnosed with the bacterial infection, and her husband, Jack, now 89, so sick with the illness three years ago that he had to be hospitalized for 10 days. Snow went to her local hospital emergency room Nov. 9 to have an embedded tick removed from her left shoulder, but was so weak and feverish she returned a day later. Her condition deteriorated swiftly despite aggressive treatment by infectious disease specialists, whose most potent medicines were powerless against the encroaching virus. There is no treatment for Powassan virus, which can spawn vomiting, confusion, seizures, memory loss, and long-term neurological problems in those who survive. It is believed to be fatal in 10 to 15 percent of those who are exposed. On one particularly rough night, with Snow hooked to a ventilator to help her breathe, Whittington stepped into the hallway at Maine Medical Center and felt a calmness wash over her. Whittington realized she was staring at one of her mother’s paintings. Years earlier, Snow had donated more than a half-dozen of her works to the hospital, and they are displayed on several of the floors, a hospital spokeswoman said.Snow’s paintings, which have been sold for years at flower shows in Boston and Philadelphia, grace the walls of a number of hospitals and public buildings in Maine, her family said. But Snow, a shy, gentle woman who started painting as a child, never imagined she would one day make a living of it. The divorced mother of three was trained as a nurse and grief counselor when she met Jack Snow, 30 years ago, in California. He was the divorced father of five children. He took one look at her paintings and knew there was something special. They moved to Maine, and opened a small art studio that grew into a sprawling family business. At one point, Lyn Snow had her own galleries in Portland and Rockland, Maine, where her husband framed her works. “In the winter, I would go to the nursery to get real flowers, because she didn’t want to paint from photographs,” he said. As the business grew, the two took to the road, selling her works at shows from Maine to Florida. Despite her passion for painting, Lyn Snow was gearing down her business to spend more time with her beloved grandchildren, riding horses, and painting with them before she fell ill. The virus that killed Snow continues to stump researchers. It is believed to be rare, with only about 50 cases reported to the US Centers for Disease Control and Prevention in the past decade. Powassan is typically spread by the woodchuck tick, which is usually active only from April to September. But increasingly, scientists are concerned that the far more common deer tick, which spreads Lyme disease throughout the Northeast, may be responsible for spreading an equally potent variant of Powassan, known as deer tick virus. Some suspect that Snow, and a patient in Massachusetts who survived a recent infection, may have been bitten by deer ticks, which are known to be active in winter when the temperature is above freezing. “The likelihood of anyone getting Powassan is so rare, and while we want people to get educated about Powassan, it’s infections like Lyme disease that are really on the rise,” Whittington said. That’s why she is now adamant with her twin 13-year-old daughters when they roll their eyes at her during daily tick checks. “You have to do a thorough check on someone you love,” Whittington said.